Shortbread is a wonderful starting point for all kinds of sweet adventures: top it (nuts, chocolate, jam); flavor it (lemon, hazelnut, coconut); or do both (cappuccino with a mocha ganache drizzle, anyone?). Then again, if you're a "make mine vanilla, please" kind of guy or gal, leave it alone; it can stand on its own in perfect simplicity. 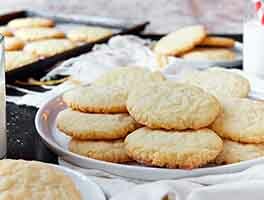 Our guarantee: This light-gold, crisp/flaky shortbread is buttery and mildly sweet. It will be about 1/4" thick. *Since butter is such a critical element in these cookies, we recommend you use a top-quality butter. Our test-kitchen choice is Cabot. Preheat the oven to 300°F. Lightly grease two round 9" cake pans. If you worry about the shortbread possibly sticking in your particular pans, line them with parchment, and grease the parchment. In a medium-sized bowl, beat together the butter, sugar, vanilla, and almond extract, then beat in the flour. The mixture may seem a little dry at first; keep beating till it comes together. If it absolutely won't come together, dribble in up to 1 tablespoon of water, until it does. This is a stiff dough. Using a pizza wheel or sharp knife, cut each round into 12 wedges. (Do this while the shortbread is still warm; if you wait until it's cool, it won't cut easily.) Transfer the shortbread wedges to a rack to cool. Set aside two shortbread cookies, and spread the remainder of the cookies with a thick layer of jam or preserves. Crumble the reserved cookies, and sprinkle the crumbs lightly over the jam. Want to make shortbread drop cookies? Drop the dough by teaspoonfuls onto a lightly greased or parchment-lined baking sheet. Flatten each ball of dough to about 3/8" thick; use the bottom of a drinking glass, the tines of a fork, a cookie stamp, or whatever implement you think will make a pretty pattern. Bake the cookies for about 25 minutes in a preheated 300°F oven, until they're set but not really beginning to brown. Remove them from the oven, and cool on the pans, or on a rack. Yield: about 4 dozen small (1 3/8") cookies. 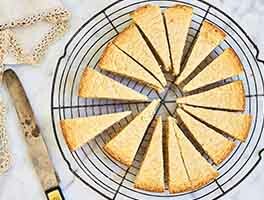 To give your shortbread festive flavor for the holidays, omit the almond extract, and add ¼ to ½ teaspoon eggnog flavor and a pinch of grated nutmeg to the dough. If you're having trouble pressing the shortbread flat in the pan because it's sticking to your fingers, cover it with a piece of plastic wrap, and push on the wrap. Remove the wrap before baking. Although we usually use unsalted butter in our baking here at King Arthur, in this case salted is preferred. Why? Because, with no liquid in the recipe, it's impossible for added salt to disperse itself fully through the shortbread dough; you end up with unpleasantly gritty bits of salt in each bite. Vary the flavor of your shortbread with the following simple additions. 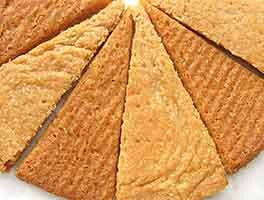 For ginger shortbread: add 1/3 cup finely diced ginger and 1 teaspoon ground ginger. For butter-pecan shortbread: add 1/8 teaspoon butter rum flavor and 1 cup finely diced toasted pecans. For chai-spiced shortbread: add 1 teaspoon ground cinnamon, 1/4 teaspoon crushed cardamom, and 1/8 teaspoon ground cloves. First time making shortbread cookies and these were easy and deliciously buttery! I used my KAF cookie presses and they looked beautiful. Dough came together nicely with mixer but kneeded a few time on counter as well. So light and flaky! A perfect simple, quick dessert that can be made day of without too much trouble or clean up. Instead of the 2 tsp of vanilla extract I used 2 tsp of rum, and instead of 1/4 tsp almond extract I used 1/4 tsp vanilla extract. I also added the zest of half a lemon. Instead of cake pans, I baked it on a cookie sheet in square cookies that were 3 in x 3 in. I'll definitely make this again! Excellent Shortbread. Follow recipe as is. I used the 9" square Snowflake Pan. One Square was too much to eat so while the cookie was warm, I sliced each square into 3 pieces (1" x 3") perfect size as long as you don't care about seeing the design. You can flip the cookie over, and you will have the fork pricking look. This recipe is a keeper. Thanks for sharing and it does make a difference using KAFlour. Made this recipe twice now, both times it came out great first time was during the holidays I pressed them into the round pan & made a dark chocolate ganache for dipping & deco. This last time I rolled them out 3/8 ths thick for round cookies nice & golden with a crisp snap & a real fine drizzle of melted chocolate. They looked great & my daughter took them to school for a friends birthday & said they went real fast. Made almost 3 dozen 1.75" cookies. I now only weigh my ingredients when possible and this recipe is to die for! I'd love to know if this exact recipe could be used as a tart base. Also, I know sometimes cornstarch is added to shortbread recipes. Would you recommend adding cornstarch? Thank you. Off to make another batch. Made this today with KA measure-for-measure gluten free flour. A disaster! Admittedly, it does not say that GF flour can be used, but I thought the measure-for-measure could be substituted in most recipes. These turned out a greasy, soggy mess. I had to bake them until they were dark brown, but they were still soft and greasy - never did crisp up. I tried calling the baker's hotline, but no one answered, though it was during open hours. Disappointed. I made this today with King Arthur's gluten-free flour and it turned out great! Cookies are scrumptious. Because the gluten-free flour produces a wetter dough, it was a little harder to press into the baking pan, and it required an additional ten minutes of baking time, but otherwise I wouldn't have known the difference. The cookies are wonderfully light and crispy, with a delicious vanilla finish. I love that the cookies were baked in round cake pans. No rolling pin or cookie cutters needed! A very nice and easy shortbread recipe! I found this recipe to be really good and easy to make. My unfortunately part is that my mixer is from the 70's and really has to work hard to get everything together, but in the end I stopped and continued with my hands until it was a good consistency. I really need a better mixer. It's delicious and I used Anise and sprinkles, like you would if you were making Jingles(now known as Santa's Cookies). They are rich and great with coffee. I will be making these gain.